There are few wedding venues that I love more than Toronto Botanical Garden. Why is that? First, the Toronto Botanical Garden grounds offer the perfect backdrops for wedding photography. Second, the gardens are very close to my place so I know them like the back of my hand. That allows me to take the bride and groom to secluded spots no other Toronto wedding photographer knows. In the spring and summer one can experience the true beauty of the gardens when a multitude of flowers bloom creating amazing backgrounds for your wedding photos. In my opinion, Toronto Botanical Garden is also one of the most beautiful outdoor locations in Toronto and Ontario. Even more, the cost of a wedding at TBG is a fraction of that in any other wedding venue in the GTA. You can bring your own alcohol as well and there is no corking fee. If that is not enough, when you book your wedding at TBG, you are automatically allowed to photograph in the gardens. That saves you the cost of a photography permit. Tina and John got married on a beautiful October day. Let me rectify that. The weather was nice until the time of the photo shoot. Unfortunately, the weather changed just after the wedding ceremony that occurred in the Floral Hall. As such, instead of taking advantage of all the beautiful maples foliage, we shot in a small area next to the parking lot because Tina was concerned that her dress would be ruined before the wedding reception. That is the reality a Toronto wedding photographer has to face sometimes. However, having experienced this situation before, I was prepared with a few umbrellas and a warm jacket for the bride. Without further ado, let's discuss this image. 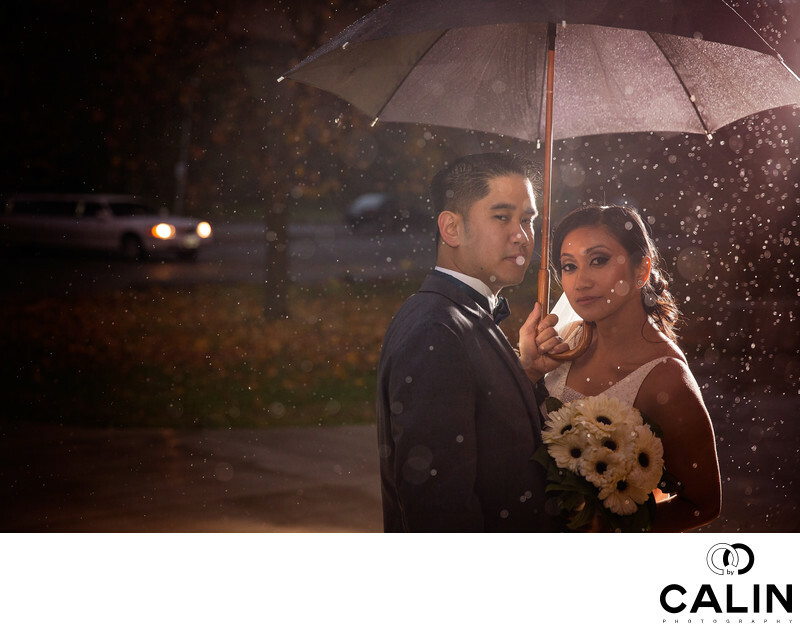 In this wedding picture we can see the newlyweds hugging each other under an umbrella while the rain is falling incessantly. Behind me, a few of the brides bridesmaids were holding her jacket for Tina to wear between the shots. I call this candid photograph "moment interrupted." Let me elaborate on that. One of my techniques that is highly successful in creating candid photos is to pretend that I'm fumbling with my equipment or that I need to change a lens. Usually, in those cases, the couples ignore me and start interacting with each other. As such, I installed a flash behind the couple, and one in front of them at 45°, a lighting schema called sandwich lighting. Because my second shooter was holding the umbrella for me so that I don't get soaked I had to time this shots properly. I knew that after my first shot, the element of surprise will have disappeared and the second shot would look, most of the time posed. After a few seconds I noticed that the couple were having an intimate moment and I try to catch it. Unfortunately, my Canon 85 mm 1.2 focus is extremely slow and the couple noticed that I was photographing them. They turned towards me and started posing but I was still able to catch them a few seconds before that. As such, their emotion is a mix of surprise at my endeavor to photograph them and romance towards each other. That's why the name of this photo is "moment interrupted." From composition standpoint, the bride and groom are positioned on the right hand of the photo along the rule of thirds guideline. Balancing them perfectly we have their limo on the left side of the frame waiting for them in case we wanted to move around to Sunnybrook Park or elsewhere in the area. There is a search of flow in this image that makes a special. The limo on the left seems to be moving towards the right, which draws attention to the couple. Another element of interest is formed by the how to focus droplets that look like fairy dust when lit by the flash. This image did not need a lot of processing because it looked great straight out of camera. I only dodged and burned the picture so that the bride's droplets would not compete for attention with the bride and groom. Location: 777 Lawrence Ave E, North York, ON M3C 1P2.